President Trump wasted no time taking a jab at his French counterpart Friday as he arrived in Paris for events marking the 100th anniversary of the armistice that ended World War I. Tweeting as he landed, Mr. Trump said President Emmanuel Macron had made an "insulting" proposal to build up Europe's military to counter the U.S., China and Russia. It was a clear sign that the "America first" president was ready to chart his own course yet again as world leaders gathered to remember the coalition that brought an end to the first global war. 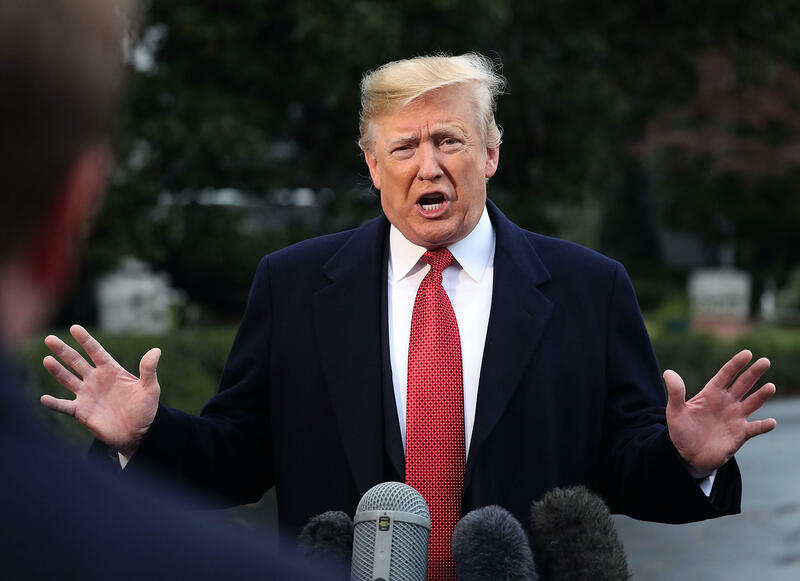 Mr. Trump's visit comes on the heels of midterm elections in which Americans delivered a split referendum on his presidency, keeping the Senate in his party's control but ceding the House to opposition Democrats. He planned to meet with Macron on Saturday for talks on topics expected to include European security, Syria and Iran. As he arrived, Mr. Trump tweeted that Macron "has just suggested that Europe build its own military in order to protect itself from the U.S., China and Russia. Very insulting, but perhaps Europe should first pay its fair share of NATO, which the U.S. subsidizes greatly!" Mr. Trump's brief visit to Europe comes amid uncertainty about the U.S. relationship with the continent. Mr. Trump has railed against trade deals with the European Union and has criticized some EU nations, including France, for not spending enough to defense to sustain NATO, the decades-old Western alliance formed as a bulwark to Moscow's aggression. At a NATO meeting in July, Mr. Trump similarly railed against the European leaders as he was meeting them, tweeting "What good is NATO if Germany is paying Russia billions of dollars for gas and energy?" The president's tweet about Germany came after he had what he described as a "great meeting" with German Chancellor Angela Merkel. Mr. Trump's national security adviser, John Bolton, said Friday in Paris that the U.S. was concerned about stability in Europe and that Mr. Trump was not shirking from global engagement. "I think the enduring lesson (of World War I) for the United States is that when you become a global power ... you have global interests to protect," Bolton said. "Great world leaders," he said, are "driven by national interests." For Sunday's armistice anniversary, Mr. Trump was to join world leaders at a ceremony in the shadow of the Arc de Triomphe. "It should be a very beautiful period of time, the 100th anniversary of the ending of World War I. We have many countries — the leadership from many countries will be there, especially since they heard the United States will be there. And we look forward to that," Mr. Trump told reporters Friday before leaving the White House. "I've seen what they have planned, and I think it's going to be something very, very special." Mr. Trump originally wanted to celebrate Veterans Day on Sunday with a grand military parade in Washington, as he was inspired by the tanks and flyovers he saw during France's Bastille Day celebration when he visited Paris in July of last year. Mr. Trump ordered the Pentagon to come up with plans for his own version, but they were eventually scrapped over concerns about costs and the damage tanks weighing many tons would do to the streets in Washington. Mr. Trump and Macron's early relationship was marked by kisses, frequent meetings and marathon power handshakes. Early on, Macron tried to position himself as a sort of "Trump whisperer" and Mr. Trump returned the favor, hosting Macron at the first and only state dinner of his presidency. But the relationship-building failed to persuade Mr. Trump to remain in the global climate change or Iran deals and did nothing to protect France from U.S. tariffs. The dividends of Macron's cultivation of Mr. Trump are "modest at best," said Stewart M. Patrick, a fellow at the Council on Foreign Relations. The president and first lady Melania Trump were expected to visit several memorial sites in France that are dedicated to American service members. Not on Mr. Trump's schedule, despite earlier discussions about the possibility, was an extended meeting with Russian President Vladimir Putin. "I don't know that we're seeing each other in Paris, but we may," Trump said. "There may be a lunch for the leaders." Mr. Trump and Putin have met previously on the sidelines of two summits and had their own bilateral meeting in July in Helsinki. At that meeting, Mr. Trump would not say whether he believed Putin or U.S. intelligence agencies about their conclusions about Russia's interference with the 2016 presidential election.